Adults of the Imperial Hairstreak butterfly (Jalmenus evagoras) appear on our block every year in early January. They make good subjects for photography as they fly low down and often perch for long periods after landing. 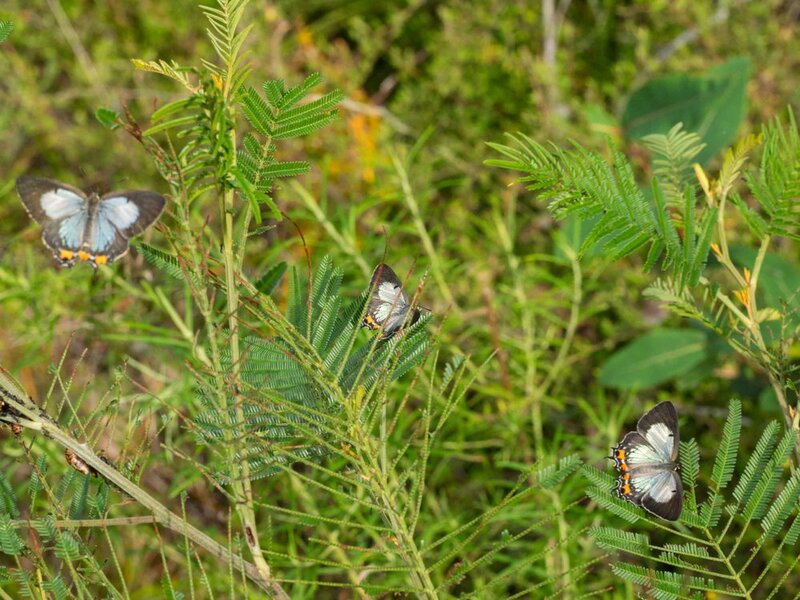 Several individuals are sometimes seen fluttering around a Black Wattle bush (Acacia mearnsii), which looks the worse for wear. This is because it is the host plant for the Imperial Hairstreak, whose larvae can be seen crawling over and devouring the leaves. Closer inspection reveals that the caterpillars as well as pupae are covered in ants of a particular species - Iridomyrmex rufoniger, the Black Tyrant ant. 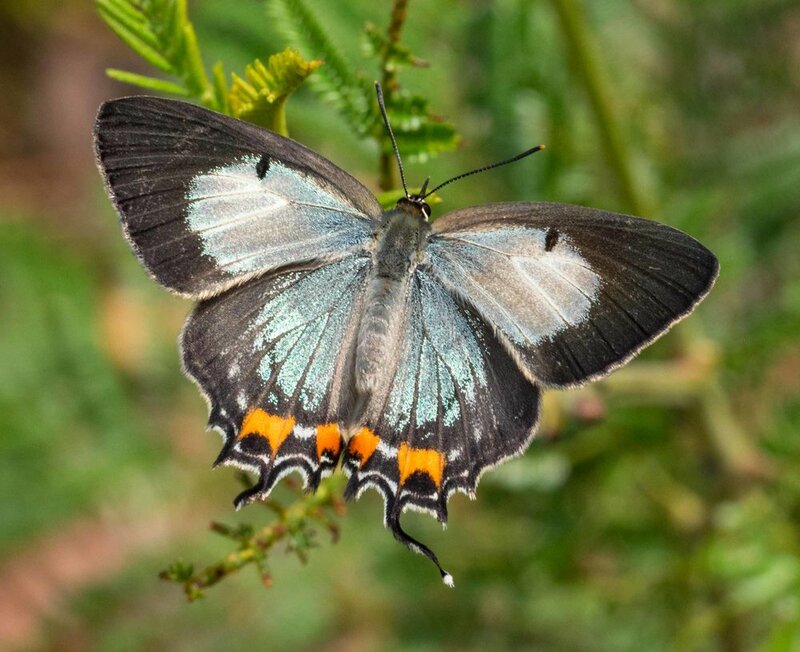 Orr and Kitching (2010) report that Iridomyrmex ants encourage the butterflies to lay eggs on their Acacia bush by "gently nibbling the tip of her abdomen as she probes the bark". Jalmenus caterpillars attended by ants. Despite their somewhat menacing name, the ants are actually doing good things. They ward off wasps that seek to parasitise the Jalmenus larvae and pupae with their own larvae. In return, the caterpillars provide a food source to the ants in the form of honeydew secreted from glands on their back. It's a win-win relationship! Orr and Kitching (2010) describe how the larvae "produce sounds...that communicate either with other larvae or attendant ants, thus promoting group adhesion and attracting ants for protection when needed". Amazing stuff! Jalmenus evagoras shows another interesting behavioural feature. Groups of males congregate at an Acacia bush on which pupae are about to eclose. Female pupae secrete pheromones, which attract the adult males. Immediately after the female crawls out of her pupal case, a male copulates with her. Not a virgin for very long! I was fortunate enough to witness this event and took a movie. The female shown at the start of the movie had eclosed less than a minute before. A male appeared within 30 seconds and immediately started copulating with her. The pair remained joined for over half an hour. During that time the successful male had to ward off repeated attempts from other males to dislodge him.